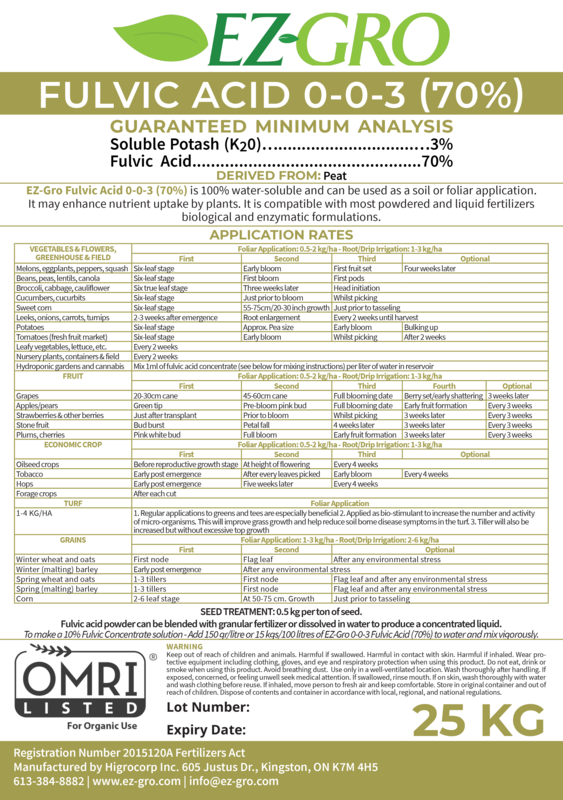 EZ-Gro Fulvic Acid is an organic non-plant food soil or foliar treatment that is 100% water-soluble and offers many benefits to your soil and crops. It is considered an efficient and effective method to enhance the uptake of endogenous and exogenous nutrients, allowing it to optimize your current fertilizer program. Fulvic acid is a potent organic electrolyte that enhances cell division and elongation, which leads to a significant magnification of root growth. It also offers protection against certain abiotic stresses like drought and salinity due its alteration of water transport and storage, and can also help stabilize the pH of your soil. Apply EZ-Gro Fulvic Acid in addition to your regular fertilizer regime to reap the many benefits on crop production and soil composition.